Smart Markets, Inc. presents the Workhouse Farmers Market, to be held every Thursday from 3-6pm* on the Workhouse Quad! Smart Markets of Northern Virginia is the newest arrival to the farmers market scene in Northern Virginia, providing guaranteed producer-only markets for the region’s discerning shoppers. Visit the Workhouse Farmers Market every Thursday for locally grown fruits and vegetables, locally raised meats and poultry, and local foods from breads and cheeses to salsa and sausage. The Workhouse Arts Center presents Asian Art and Culture Day at the Workhouse, National Cherry Blossom Festival 2013. This is the Workhouse’s 3rd annual National Cherry Blossom Festival event. From 11am – 4pm the day will feature demonstrations, performances, participatory workshops, presentations and exhibitions featuring Asian art and culture. Presenters include Japan-America Society of Washington DC, George Mason University, Workhouse Artists and Ikebana International. All activities are FREE. LIVE onstage! Mestey Films Productions presents Cinderella: The True Story. 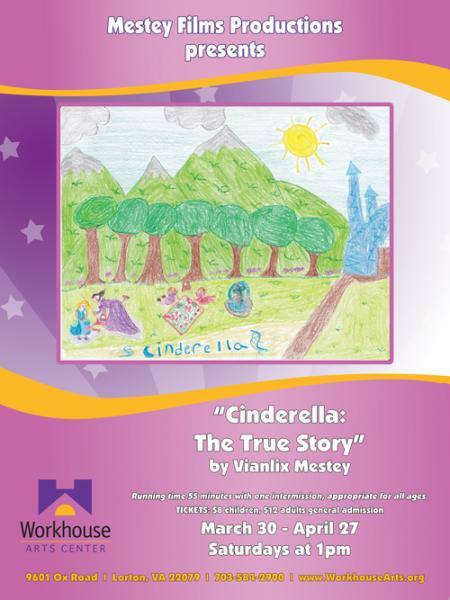 Join us for an afternoon of laughter and mystery with playwright Vianlix Mestey’s original adaptation of the fairy tale Cinderella! Cinderella’s sneaky step-sisters, and evil step-mother will do all they can to stop The Prince from finding Cinderella! Group rates available, please inquire. Approximately one hour with intermission, concessions available onsite. An exhibition of Virginia high school art submitted for the Annual Congressional Art Competition from the 11th Congressional District. The Congressional Art Competition provides an opportunity for Members of Congress to encourage and recognize the artistic talents of their young constituents. Over 650,000 high school students have participated in the nationwide competition. One young artist from the Workhouse exhibit will have his/her work exhibited in the U.S. Capitol. The 2nd Saturday Art Walk at the Workhouse showcases the diverse work of more than 100 visual artists in a unique historic venue, creating an atmosphere that encourages visitors to immerse themselves in the richness of this creative community. Guests can tour seven unique studio buildings, mix and mingle with artists, buy original works of art, experience ever-changing exhibitions and meet featured artists, all while enjoying light refreshments and music. The social atmosphere of the monthly art walk makes it the perfect destination for a date night or girls’ night out, as well as for art collectors and art appreciation groups alike. These monthly events are also perfect for family art outings. Standing Room Only will feature a selection of 20 artist customized bike seats. This show will transform the everyday and familiar seat into work of art. The show’s title makes reference to this change in the object’s function; what is usually seen as a tool for sitting and part of the bicycle unit will become an object of display and will be exhibited as such, standing on pedestals as purely an art object. Each seat will be re-purposed and uniquely selected for each artist. Enter to win a four-pack of tickets for either the March 30th or April 6th performance. Shows are at 1 p.m.